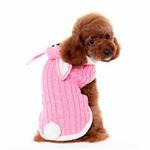 This happy hooded Bunny Dog Sweater by Dogo is comfortable and chic and hopping fun. 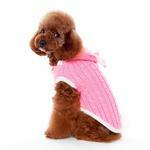 This high-quality sweater is stylish and warm, and it features cable knit design with a white bow tie and pom bunny tail. Complete with a stylish comfy hood complete with little ears and bunny face! Pullover style and it includes a leash hole! 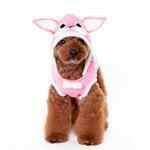 Bunny Dog Sweater by Dogo Customer Photos - Send us your photo! Some Bunny is ready for Easter !! 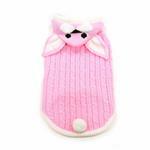 Our 16 pound Dachshund Zaylee definitely is in her Bunny sweater ( size medium) !! Izzy loves to play outside. She is a red dachshund and loves her baxterboo clothes. Zaylee is wearing her Bunny Dog sweater to get ready for Easter and all the yummy food that mum makes . She defiantly looks cute enough that she will get plenty of food from everyone !! Who could resist that adorable little face !! Posted On 03/24/19 by Korena S from King City , OR Yes, Korena S recommends this product! We are big DOGO fans and this doesn’t disappoint. 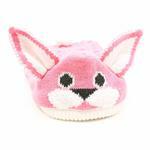 Fits fantastically and is so so cute!! Posted On 09/10/17 by Valarie Janowski from Springfield, VT Yes, Valarie Janowski recommends this product! Adorable! Looks cute on my dog. Posted On 01/03/17 by Angela M from Oxford, ME Yes, Angela M recommends this product! This sweater looks adorable. I also love how easy it is to get on and off and the fit is perfect. Our Aussie looks so comfy in this outfit as the material has just enough stretch. She looks super cute in this getup ... and she knows it! The little bunny ears and pom pom finish this sweater perfectly without overdoing it and making it look "costume-y." We are so pleased. Posted On 09/27/16 by lynne s from East Moriches, NY Yes, lynne s recommends this product! What a cute sweater. Looks cozy & feels soft. Posted On 09/14/16 by Jenny S from Sunrise, FL Yes, Jenny S recommends this product! This bunny sweather is absolutely breathtaking, and with little Mia in it she good to do a photo shoot! Just luv the quality and color it's so smooth and comfy. Also like to thank for such great customer service they were very helpful and kind with my questions about sizing. Will continue to order for Mia's future needs! Posted On 02/26/16 by Christina B from Redlands , CA Yes, Christina B recommends this product! Posted On 11/30/15 by Sonia L from Los Angeles, CA Yes, Sonia L recommends this product! 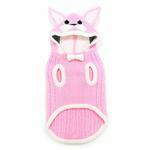 I bought this bunny dog sweater for my 11 pound miniature pinscher in a size medium. It fits perfectly and it is so well made. 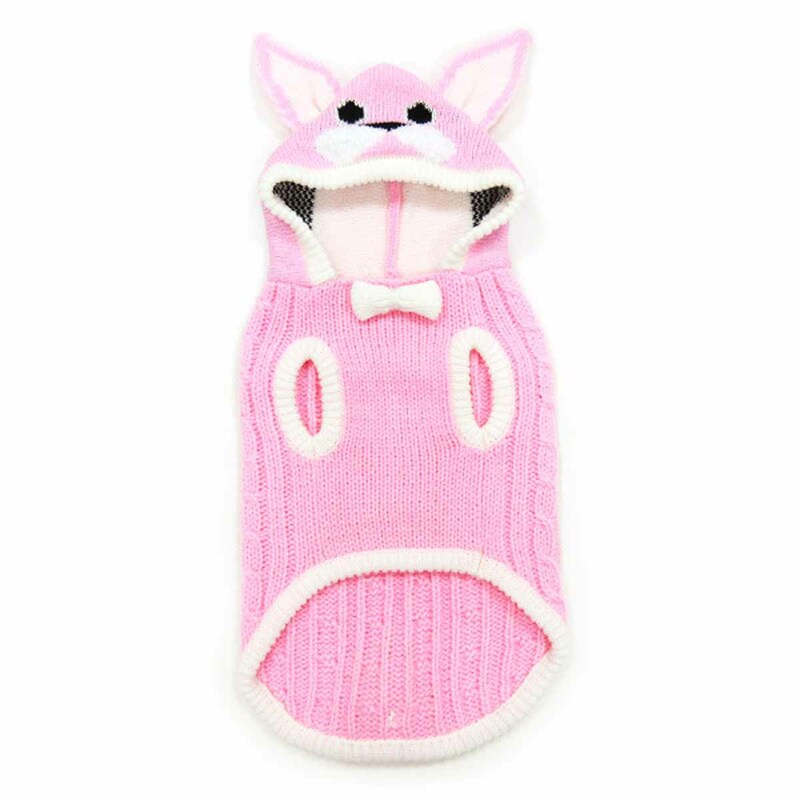 I'm looking forward to having my dog wear this for the Easter season! I'd definitely recommend this! I ordered a size medium harness according to the dog's weight without measuring his chest. I can't return it because I already sewed his Service Dog tag onto it, so I'm ordering a larger one.